You have rules for what kinds of content are allowed on your site and what is not, but do your commenters know these rules before they post? One of the most common questions we get from commenters is "why was my comment moderated?" The Comment Policy feature makes it easy for publishers - without needing to edit their site's HTML or templates - to display their community guidelines so that everyone knows the rules. 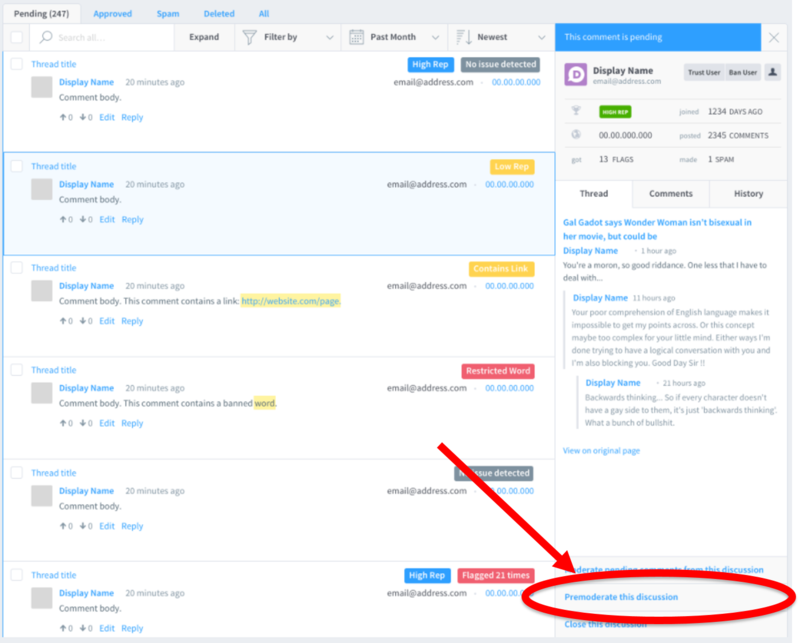 Admins and moderators can implement and edit Comment Policies from their Disqus General Settings by adding a short summary, as well as a link to a dedicated community guidelines page on your site. 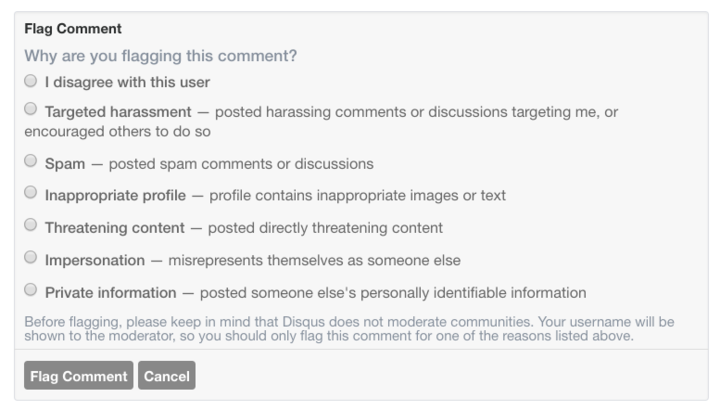 The Comment Policy appears right above the Disqus comments, making it highly visible for commenters. Don't have a comment policy yet? You can find examples and suggestions from our Knowledge Base. Below is an example from our friends at Elliott.org. Elliott is a leading consumer advocacy site, focusing on the travel and hospitality industries. Expecting the discussion on a specific article to get unruly? Thread-level Pre-moderation can help! Pre-moderation is an option to set all comments to pending and will prevent them from appearing publicly until they've been explicitly approved by a moderator. Until now, Pre-moderation has been a site-level feature. 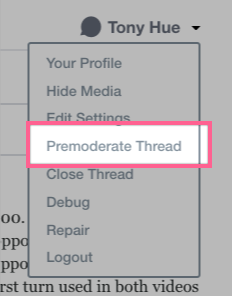 With Thread-level Pre-moderation, publishers can choose specific threads (articles) to apply Pre-moderation. This added flexibility allows publishers to apply Pre-moderation to specific threads without pre-moderating comments across the rest of their sites. Recently we released an update to User Reporting that allows the reporting user to specify a reason. We just implemented the same functionality for Comment Flagging. Now when a reader flags a comment they will need to choose a reason for flagging the comment. The purpose of adding flagging reasons is to reduce flagging abuse (the “I disagree with this user” reason will not be counted) and help us identify illegal content. We ran the numbers and we're excited to share that total flags across the Disqus network have decreased by 45% since we implemented flagging reasons a few weeks ago. This means fewer false positive flags and less work for moderators. Additionally, moderators can now see the flagger for comments that have only been flagged once. In order to avoid future conflicts, after you flag a comment, we suggest that you also block the poster of the comment. While we are very excited about sharing this first set of new features today, this is just the first of several updates slated for release in the coming months. We are currently hard at work on implementing natural language processing and machine learning to help moderators identify and deal with toxic and other unwanted content quicker and more effectively. After that, we plan to focus on ways to provide better feedback to commenters. Continuing on our work with the Comment Policy we are looking into ways to better align expectations with commenters before and during posting. Questions or comments about the new features? Interested in what we are working on next? Let us know in the comments below!